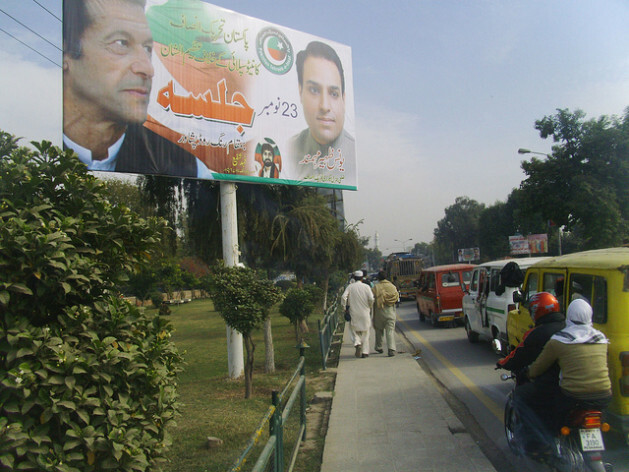 PESHAWAR, Pakistan, Nov 22 2013 (IPS) - Upping the ante against U.S. drone attacks in Pakistan, celebrated cricketer-turned-political leader Imran Khan has threatened to block NATO supplies to Afghanistan through Khyber Pakhtunkhwa province, where his party leads a coalition government. “We are holding the biggest ever anti-drone protest in Peshawar, where we could decide to block NATO supplies permanently,” Khan, who leads the Pakistan Tehreek Insaf (PTI), told IPS ahead of massive protests planned by the party for Nov. 23. “We don’t want to start a fight with the U.S. but we have every right to protest these illegal assaults which kill innocent people,” Khan said, calling the attacks a breach of international law and a violation of human rights. His party is enraged over a U.S. drone strike at a madrassa or religious seminary that killed at least eight people in Hangu district of Khyber Pakhtunkhwa, in northwestern Pakistan, on Nov. 20. The PTI leads the coalition government in Khyber Pakhtunkhwa, which is one of two key routes used by NATO to move supplies in and out of neighbouring Afghanistan and is strategically important as U.S.-led forces prepare to withdraw from the war-torn country in 2014. When the party had organised a major two-day protest on Apr. 23-24, 2010, NATO supplies were suspended. The PTI has staunchly opposed drone strikes in the Federally Administered Tribal Areas (FATA), adjacent to Khyber Pakhtunkhwa. The strikes target Al Qaeda and Taliban leaders who have taken refuge in FATA along a 2,400-km porous border with Afghanistan after being evicted from Kabul by U.S.-led forces towards the end of 2001. FATA, which is directly ruled by the federal government, is teeming with militants, some of them with huge bounties on their heads as they are aggressively pursued by the U.S. for alleged involvement in the Sep. 11, 2001 terror attacks. Many high-profile Al Qaeda and Taliban leaders have been killed in the drone strikes. Khan said his party wants to convey to the world that the U.S. government is killing innocent people in the garb of targeting militants. “Even if those targeted in these strikes are supposed militants, the U.S. has no right to kill them without taking the Pakistan government into confidence,” Khan said. Besides, while most drone attacks have taken place in FATA, the Nov. 20 strike was in the PTI’s stronghold of Khyber Pakhtunkhwa. “We won’t allow drone strikes on Khyber Pakhtunkhwa soil,” Khan said. He had earlier stated that they would stop NATO supplies even if it meant his party losing its place in the provincial government. But he later stressed that only his party workers would take part in the protest. “The PTI government in the province will stay away from the protest because we don’t want to take any illegal steps,” Khan said. The PTI has been accusing Prime Minister Nawaz Sharif of failing to raise the concerns of Pakistani citizens about drone strikes with President Barack Obama. “We were the first to point out that these strikes were in total contravention of U.N. and other international law that guarantees the sovereignty of any country,” he said. He said the U.S. had sabotaged the government’s proposed peace talks with the Tehreek Taliban Pakistan by killing its leader Hakimullah Mehsud in a Nov. 1 drone attack. “Targeting a madrassa with missiles from a drone, killing our citizens, is a clear violation of the province’s territorial rights,” Muhammad Junaid, a PTI worker, told IPS. The shopkeeper from the militancy-hit Swabi district said drone strikes kill innocent people, including women and children, and should not be permitted by any country. The Jamaat Islami Party and Awami Jamhoori Ittehad, the PTI’s allies in the provincial government, are on the same page. “Upwards of 150,000 protestors will take part in the protest against drone strikes and over the continuation of NATO supplies,” Jamaat Islami chief Syed Munnawar Hassan said. “We can stop them [NATO supplies] permanently,” he said.